When December came, the mood in the Philippines is always festive. We can't wait enough for reunions, parties and long vacations with families and friends. We consume the long days with movie marathons, and exhibits while others go for recreational events including Online gambling, indoor sports, beaches and shoppings. When work and school resume January 4, it is only high time when every one gets to have fun during the holidays after a year of hard labor, economic recession and tragedies. Our family in Wisconsin did battle the long winter but overall, they had great time during the Christmas break. We sure want our loved ones to enjoy the holidays in any way they can. My youngest sibling and her fiance did come for the holiday. We only maximize the holiday breaks for any fun stuffs. Sarah Geronimo Concert Blog Contest Grand Prize: Me! This is quite too late for a post, but I failed to mention that I indeed won from Sarah Geronimo Next One Concert in Gensan through my entry. I have won gift certificates, VIP concert tickets and I simply had fun from hearing beautiful songs from great artists. I have to thank Michael Wee, the concert producer and owner of Grab a Crab and Coffee Club and Bariles for initiating concert. I can't wait for the next concert again. hahhahaah! Who does not want to look good and feel good? I am pretty sure that everyone clamors for this state of feeling and wanting. With the fast – changing lifestyle, sensible diet and regular exercise seem a struggle and futile. No wonder there is a dramatic increase of obese or overweight people nowadays than the time when TV or computer was not invented yet. With entertainment technology and fast food, weight problems have become a global problem not only among the old but also among the young ones who are supposed to be active and athletic but now have gone obese. The struggling endeavor for weight loss through strict diet or tedious exercise with less visible effects makes people go for cosmetic surgery including liposuction. However, although cosmetic surgery is optional for some who have exhausted all means to gain that desired weight loss, a cosmetic surgery is only the most preferred solution. Patients however, must go for qualified physicians since there are cases of plastic surgeries that have gone wrong. Plastic surgeries have dramatically improved too that there is a thing like smart liposuction. One can easily experience fast – healing, less – scars and more effective liposuction from sono bello. What gains increasing popularity is the use of laser – assisted body sculpting that can go through difficult areas where traditional liposuction can’t make through. Further, since it is heat – based, it encourages the body’s natural healing that makes the patient recuperates within 48 hours. Patients then must assess well the pros and cons of this procedure and if they must seek the professional advice of their doctors before they subject to any cosmetic procedure as risks are always there when any surgery is involved. It is then imperative that we are better informed than experience evitable ill consequences. While everyone else had done reading this quite famous book, I just had the entire four books read during the entire week. The e-books were given to me by a blogger - friend a year ago but since I had no time and had no patience reading, I simply watched the movies. But, after seeing New Moon and quite lost with all the scenarios, I went through the hard prints. Gosh, the book is better understood for a more vivid scenario. ahahhahhah! What can I expect anyway? LOL! I finally finished them in between school classes, business, blogging and all. I had to miss checking my test papers though just to finish reading. And, I must say, it was all worth it. Hurray! It is quite frustrating that some apparel stores only cater to medium - sized people. Sometimes, customers would have to customize their purchases to fit to their statistics. This is quite true for us since my kid is quite big for his age. I have to go to scout harder for his clothing. We have to scout for quality kids' stuffs too since substandard stuffs don't last for his weight and mobility. It is however, nice to know that there are Big and Tall Clothes for Big and Tall men. Further, they have accessories, Big and Tall jackets, shoes and more. Our big customers would normally feel disappointed that our fashion boutique don't offer plus sizes. It shall be a great news to them to know that there are online stores for best buys. My cousin - store attendant was absent today. So, we endure the frenzy moves of orders left and right. Gosh, I could feel my fingers went numb and complaining. My feet and shoes are all drained and stained. waaaaaaaaaaaaaah!!!!! I am only counting the days that everything would be over and that we can resume to our usual works. Every night we have to stay until 12 to close. I must however, stay up longer since I have to write for my blogs. hahahhaha! I simply feel so drained. No wonder, most of the sales persons are grumpy. Their work is pretty tiring if not boring. It is December officially and we are just too excited to wait for vacation and experience more time for family and rest. But with the coming new year, we have this feeling of deja-vu too to hope for better life, new ventures, more posts to write, new blogs. I had started a blog in Wordpress but the theme is still generic, so I shall soon work on its Wordpress theme. I wish better life for my loved ones, good health for everyone too. But, most likely, our boutique will be at the mall, so, this requires greater pressure as we need to have regular new stuffs to beckon customers. My food business will be in place too. New year shall be a new busier year for us. Forgive my title but this is really what I feel. I am dead tired working day in and out. I attend to the family in the morning, head to the boutique store in the morning, go and teach to my afternoon class, go to our food stall every late afternoon, blog in the evening. I simply sleep around 1 am and sleep for 5-6 hours. These are my regular activities not counting the other things I have to do for the store or class. Geez!!!! I am no superwoman and I am simply drained. I found hobby that can get me relaxed, reading Twilight Series. Hahahahah!!!! Medical studies show that as a person gets older, he gets bigger unless he lives a healthy lifestyle and with regular exercise. This is pretty true for me because as I age, I find it difficult to lose the extra bulges. Worst, I get heavier each day because I don't jog anymore and I spend most of my time before my computer or TV. Having a food store only aggravates the condition. I could not blame others who go through plastic surgery to shed off that extra bulges. Looking good contributes to feeling good. Thus, this is only explains the passion most people have for plastic surgery. However, there are also plastic surgeries that have gone bad. Although these are rare and isolated, they can scare away potential patients who would want to consider cosmetic surgery but too afraid to handle the risks. It is then, important that they only consider qualified and competent plastic surgeons who really have the appropriate trainings. I was able to witness one video of how traditional liposuction removed unwanted fats. It was quite gross and painful. And since the surgery is quite serious, the patients require longer recuperating time. However, technology on cosmetic surgeries have improved already. One of the safest and most effective media in weight - loss surgeries now covers laser lipolysis a.k.a smart liposuction. Unlike traditional liposuction, smart lipo does not use suction. It makes use of tiny cannula covering the laser to liquefy the fats and then, they are drained through a tiny incision. With this method, most patients can right away resume to their regular doings like work after 24 hours. The pain is less to moderate within 48 hours and normally, patients simply go through a local anesthesia. Smart lipo has greater advantages over traditional liposuction. First, the cannulas are small thus, the incisions are smaller too producing only small scars. Second, smart lipo can work on difficult areas like chin, upper arms, waist, face, and male breasts. Lastly, the heat energy from this method makes body's natural healing works, making the treated tissues tighter and smoother. Adults who have good health and stable weight within the year can apply for this procedure. It is now easy to look for Smart Lipo through the competent hands of physicians from sono bello. The clinic performs greater numbers of successful micro laser assisted liposuctions and laser sculpting than most clinics. The procedures indeed guarantee permanent fat loss at safest way and reasonable rates. It is only imperative that potential patients know the benefits of smart lipo and that the physicians are qualified otherwise, they may risk their health and lose much from jeopardize plastic surgeries. Cosmetic surgeries should make us look good not the other way around. Basketball is Just My Thing! I am hardly a sports person. Other than watching Pacman on the big screen, I can only settle for basketball games. I guess, I got this liking from the influence and inclination of my close male friends and husband. Geez, I can never nudge them an inch when they are already hooked to basketball plays. I can't blame them because excitement is usually intense that I would somehow feel my heartbeat drum together with the cheers and boo's of the audience. Basketball is quite a game among Filipinos and naturally, it has become a favorite past time other than watching teleseries or betting on lotto. So, when I read through GenSan News Online Mag that another big event shall be coming over to Gensan, I can only be pretty excited since two (2) of known PBA teams, Coca-Cola Tigers vs. Talk 'n Text Tropang Texters in Gensan will bring the hype of the PBA game on December 5, 2009 at Lagao Gym. I give tributes to all its generous sponsors, General Santos Local Government and PaperView Office and School Supplies for making this Christmas Holiday much brighter and fun. This city has become more and more known because of national artists and VIP's visiting our beloved GenSan. The place shall be sure jammed with supporters and fans of these two great teams. Best of all, two of the key players are hailed from SOCCSKSARGEN namely, Koronadal City's Kenneth Duremdes, 1998 MVP Player and now, coach for Coca Cola and Gensan's Francis Allera, small forward for Coca Cola team. I can't wait to cheer for the team and say boo should I see dirty tricks but what I am more excited to do is to have my big smile for a camera shot with these big giants. Should I miss this big exciting day? Definitely not!!!!! I came to know the name Sarah Geronimo when she gave a heart - breaking rendition of the song Broken Vow from the original play in Meteor Rain (Meteor Garden II) when Sancia and Dao Ming Si were parting ways because of Yesha! I could only contain the overwhelming emotion from loss, love and soul of the story, the song and the singer. I could only wonder with admiration and praise how a teenager and a novice can carry out a song with so much power and emotion. Since her winning piece of "To Love You More" from Star For A Night hosted by Ms. Regine Velasquez, Sarah rose to stardom and has conquered the reigning title of Pop Princess. But, just like any other successful leader or artist, Sarah went through a difficult ordeal of regular practices, unceasing singing contests and stage shows as early as 2 years old, and restrained lifestyle from a mediocre family earnings. But, these only directed Sarah to the kind of success she savors now. Sarah Geronimo is an inspiration to the youth that anyone can just dream big and do big in spite of financial limitations or social stature. With unbending will, anyone can do more to overcome his average skills. 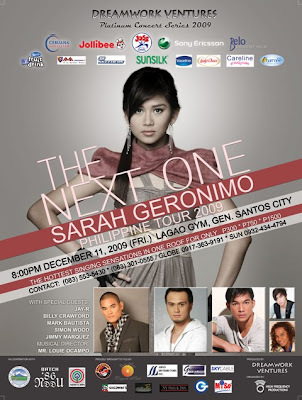 And so, when I heard from GenSan News Online Mag that she is coming over again to General Santos CITY for a Sarah Geronimo-the Next One Concert, I feel that I must see this young lady perform live on December 11, 2009 at Lagao Gym. I am only happier that once again, our beloved producer, Mr. Michael Wee and sponsors have initiated the 5 Reasons why you should watch ‘The Next One Concert’ BLOG Contest where any blogger can win fabulous prizes to this most awaited pop concert. But, why should I watch this concert, let me present my overwhelming reasons. 1. Sarah Geronimo is an icon for DREAMS and MAGIC. A daughter of a retired PLDT father and a parlor owner, she proved that anyone who simply pursues his dreams in spite of economic limitations or otherwise, can conquer his dreams and make miracles and magic come to life. 2. Sarah Geronimo is an epitome of CHARACTER. In spite of what she had accomplished as a singer and performer, she never failed to remain humble, kind-hearted, dedicated and persevering. In all the interviews I heard about her, never did I hear she complained about her long and hectic schedules or competitions with other rising singers or bragged about her earnings or assets. She still remains to heed what her family would say and enjoys every time she can with her loved ones. No wonder, fans incuding me, continue to adore this sweet lady. She manifests values of respect, love for family and others, honor and dedication among other things which other people on and off showbiz fail to exhibit after all the glory and social recognition. Sometimes, we have to humble ourselves for what we have achieved to really savor true happiness at its most basic definition. Sarah Geronimo makes my mindset this way. 3. Sarah Geronimo is a true ARTIST. As a young artist, she can capture her audience remarkably with the strength of her voice and with the heart of her songs. She can make her listeners feel every pain, joy, hope or loss from how she would deliver the songs. She can make an ordinary old song come to life and her stage energy can only influence you to enjoy the music, to enjoy life. She can perform with others without overwhelming them. This shows a strong sense of respect and humility for other artists. 4. Sarah Geronimo is LIFE. Being old is not easy at all. We seem to complain more and more about work, relationships, time and people. But, Sarah is a reminder of the kind of energy or lack thereof, when we were younger. She is reminder that we too in spite of our age, can have fun with what we do love, that we too can enjoy life because our loved ones are around us and that we can enjoy life because we have it in our hearts, that we can enjoy life through the lapses, and difficulties we have. 5. And lastly, I have to watch this concert because I shall be seeing more than one hope, more than one inspiration, and more than one remarkable artist. Sarah Geronimo and her guest performers, Jay-R, Billy Crawford, Mark Bautista, Simon Wood and Jimmy Marquez, shall be conquering the night and shall be filling us with heart-warming and inspiring songs that we can all use especially through our moments of despair and loss from political, economic and social turmoils the country is in. They are young artists that make each one of us proud that we are Filipinos and that we have talents with great heart and humility at par with international renowned performers. I have to see this concert because I am proud that I shall come to hear great songs from great Filipino artists.